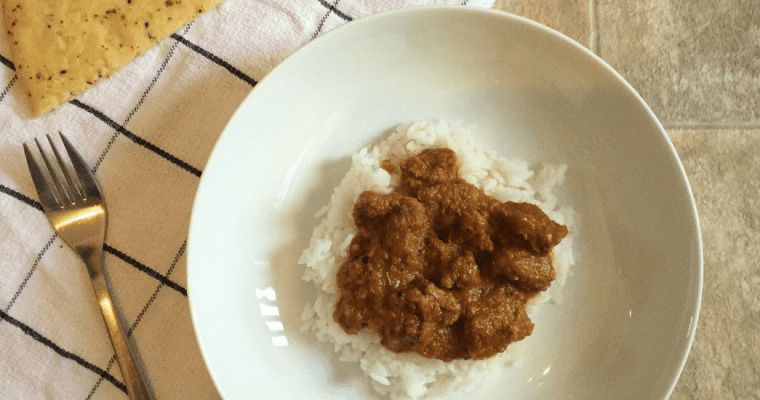 Lamb Kleftiko is indulgent, tasty, filling, and quite simply fantastic. I’ve been to Greece a few times and it’s always been my favourite thing to eat. A big roast joint of lamb is, I guess, pretty warming and wintery. But, Greek food always reminds me of lovely summer holidays, so this to me is actually a wonderful summer meal. It makes me think of long afternoons sipping cocktails by the pool and eating outdoors with a cool glass of wine. It’s everything that summer should be. We cook Greek food quite often, we also order from a Greek takeout. But, we tend to stick to souvlaki style wraps and things like that. I love Greek style flatbreads, they’re so tasty and fluffy. When it comes to roasts, I think I’m probably a little bit boring. I bang it in the oven and leave it. So, Lamb Kleftiko is a fabulous change all around. It takes a long time, but there’s not actually too much to do. You rub the meat with the marinade and then leave it overnight. So that’s maybe ten minutes work. Then, you put it in a big parcel in the oven and bake it for 5 hours the next day. Again, very little work. Cooking in a parcel like this also means that there’s hardly any washing up, which is always a bonus, isn’t it? 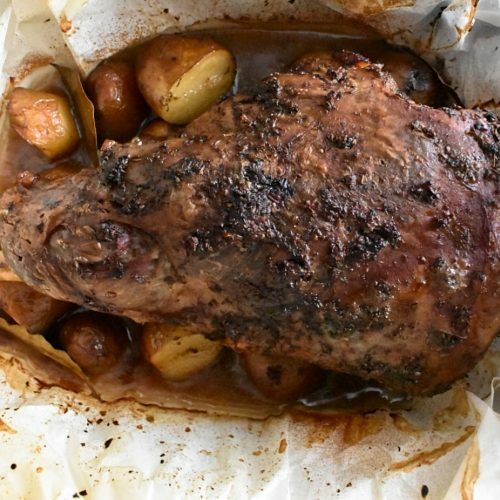 Greek Lamb Kleftiko is soft and juicy, with bags of flavour. Lemon juice, oil and a few herbs and spices is all it takes to create this delightfully delicate Greek flavour. The lamb is just so soft, it’s perfect. It also smells fabulous. Honestly, even when it’s raw in the fridge it smells wonderful, and when it’s cooking I could smell it from my car, parked down the road! 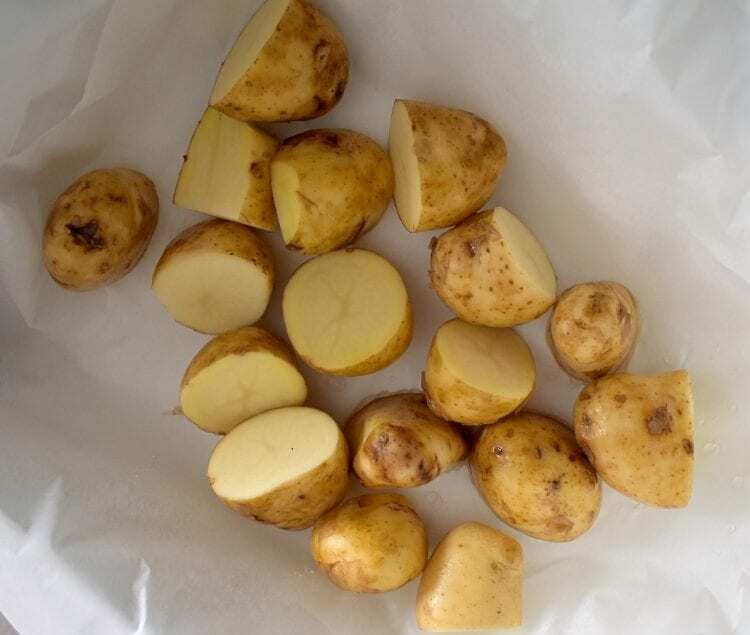 Then, there are the potatoes. 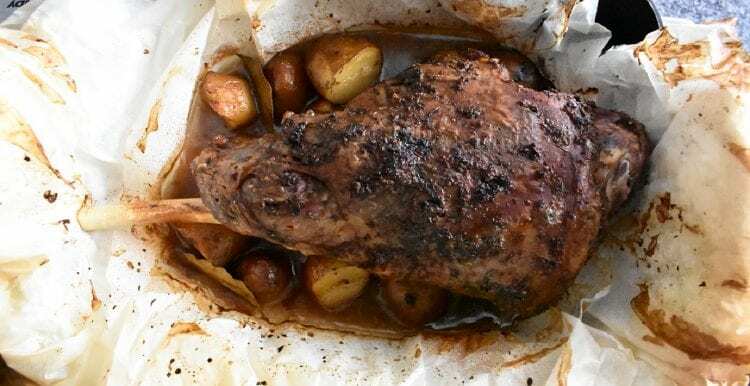 Because they’re also cooked slowly on a low temperature, and under the lamb, all of the juices run on to them, and they kind of poach in the lemon juice and juices from the lamb. They are gorgeous. 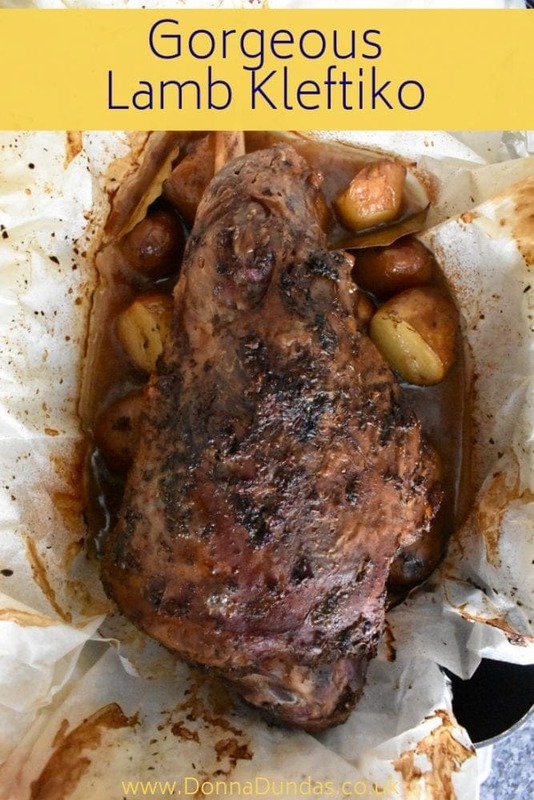 A gorgeous, slow roast lamb leg in a fantastic Greek style marinade. Mix together 2tbsp of the oil, the garlic, oregano, lemon zest, rosemary, oregano and cinnamon. Use a large knife to stab lots of holes in the lamb. Making sure they are deep. 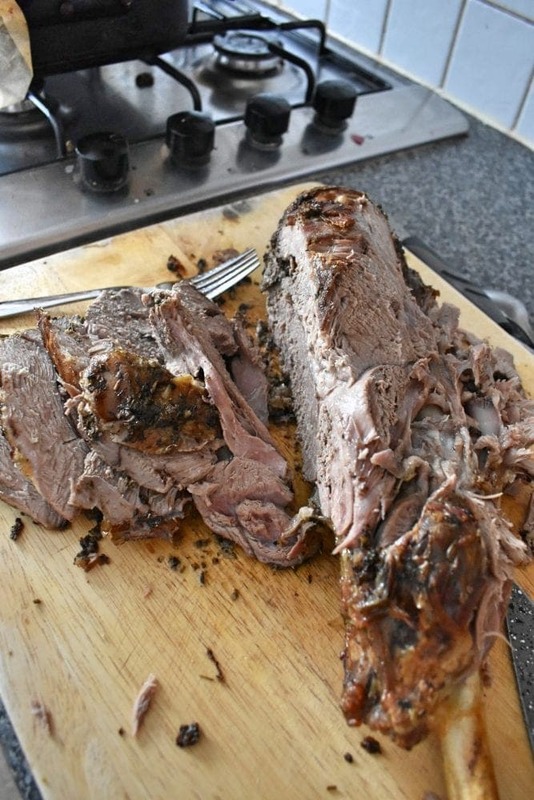 Use your fingers to rub the mixture onto the lamb, pressing it into the holes as much as you can. Place the lamb into a large food bag, add the lemon juice and seal. Leave this in the fridge overnight. When you are ready to cook, preheat the oven to 140 degrees, or 160 if not fan assisted. Make a large cross with 2 long strips of foil (enough to wrap over the lamb). Use greaseproof paper to create another cross, over the foil. Place this into a large baking tray. Add the potatoes to the centre. Pour over the last tbsp of oil and add the bay leaves. Place the lamb on top, and pour over any juice left in the bag. 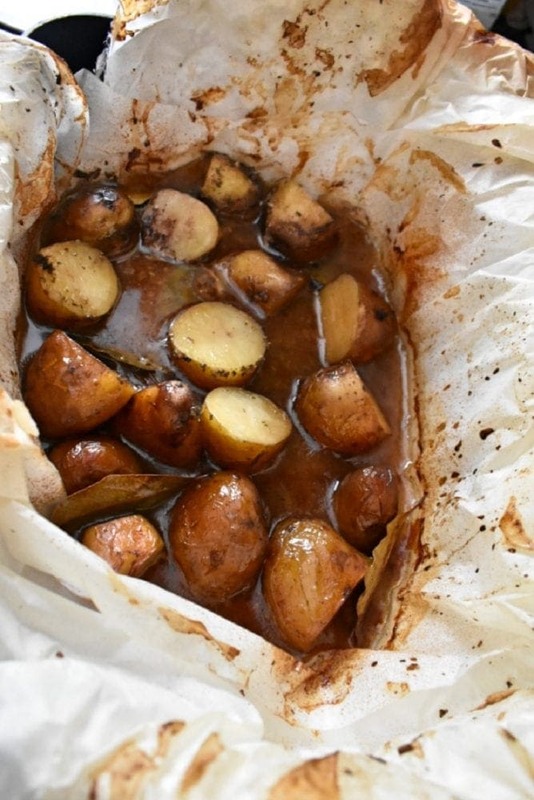 Wrap over and scrunch up the greaseproof paper to create a parcel, then wrap the foil over the seal it all in. Bake in the oven for 4 ½ hours. Remove from the oven and turn the temperature up to 200 degrees. Unwrap the foil and paper and tuck under the outsides of the baking tray. Use juices from the bottom of the tray to baste the lamb. Return to the oven and cook for a further 30 minutes. Remove from the oven and place the lamb on a chopping board to rest for 30 minutes before slicing. 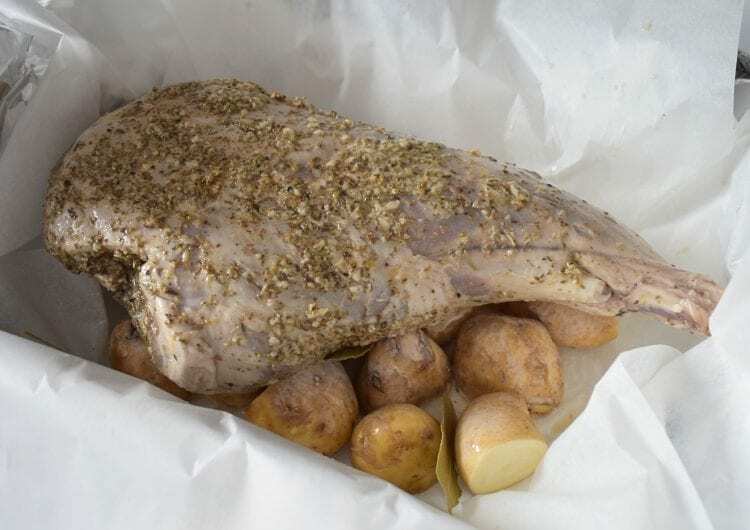 If you want your potatoes to stay warm, rewrap and return to the oven at around 100 degrees while the lamb rests. You also need greaseproof paper and foil. We slice the whole leg and eat the leftovers with flatbreads and tzatziki.